“Everything about her was different from every other Knight. She had a different build, a different weapon, a different sprite, and different challenges.” (Kindle Locations 2034-2035). Claire is a Spirit Knight and even though she still isn’t accepted by everyone in the male-dominated group, she wants to show them that she is really a Knight. After she gets a dragon as her sprite and has won a weapon from the Heart of the castle, Claire is ready to begin training. But, before she can truly prepare, things start to go wrong. There are mysterious things going on and Claire and Justin must figure out what’s going on before it’s too late. I found the pacing good, the tension good and storytelling solid, but there were a few characteristics of this book I didn’t like. Justin felt almost like a villain when he was supposed to be supportive of Claire. There were a few scenes where his thoughts about his family were less than positive and that made me uncomfortable. I thought he was supposed to be the hero passing the torch to the new girl? I believe that there are outside forces that influence how he perceives the things he loves, but I wish he had remained the underdog hero instead of the villain’s assistant. Justin is your average knight, but even so, he was easily manipulated and seemed to get caught in the simplest of traps that Claire was able to figure out immediately! How can one be a Spirit Knight, when one is so easily undone! This did let Claire be the hero and this is her story. I did like that there were average knights like Justin and that he tries to be valiant, that he tries hard all the time. I liked most everything about Claire. The scenes between her and the Heart of the castle were awesome! I loved how in every situation she found herself in, she didn’t give up, even if she had no real weapon. She wasn’t afraid to use her fists! Dragons. Super cool. I liked how the dragon actually had his own backstory and personality. I found the twist of the main plot to be obvious. The clues were so good that I guessed what was going to happen quickly. All new information led directly to this obvious ending, which was still satisfying even though I knew it was coming. It was the logical ending. 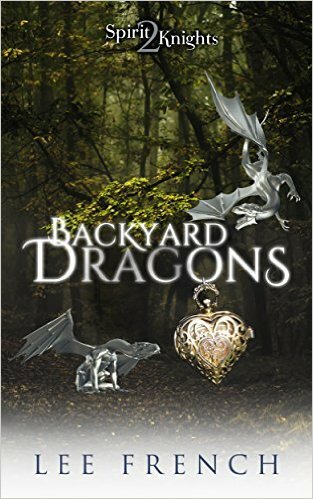 This novel was published by Clockwork Dragon on March 11th, 2016 and is available on Amazon here.